Somewhere between albums and EPs, these Arizonians shifted gears into becoming a death metal band. I have to admit I missed the transformation from deathcore and grindcore to fully fledged death metal. Even worse, I had gotten into them with their debut deathcore EP ‘Doom’. That style was what I had associated with Job For A Cowboy. But when I heard faster riffs, inhuman drumming, and shredtastic solos, it became apparent that this new direction they had taken was well thought-out, and very much impressive. Carrying on from last year is the new guitarist-bassist combination of Tony Sannicandro (Contagion, End It All) and Nick Schendzielos (ex-Cephalic Carnage) respectively. The first track ‘Children of Deceit’ perfectly establishes the abrasive intentions of the band. I was hoping for a breakdown somewhere, but by the end of it, there was a feeling of relief that there weren’t any gimmicky (prefix)-core techniques. The second track ‘Nourishment Through Bloodshed’ is definitely one that sticks. Never ever could anyone have produced brutality that is so slick and on target. Vocalist Jonny Davy said that they “approached this record with the mindset of everyone just being as creative as they wanted”. This is relevant because most fans and critics bemoan constant line-up changes. On ‘Demonocracy’, this new line-up sound perfect in every brutal way. There’s nine tracks on ‘Demonocracy’, which is a safe number considering the risk of creating something formulaic. ‘The Manipulation Stream’ is simply punishing, harmonics and everything else thrown in and out. Thematically leaning towards 2009’s ‘Ruination’, the lyrics and song titles (‘Deity Misconception’, ‘Fearmonger’ and ‘Imperium Wolves’) are politically damning, to say the least. Schendzielos’ work with the bass guitar needs a special mention, specifically for pulling off a savage track such as ‘Deity Misconception’. The album ends with ‘Tarnished Gluttony’, which is a bit slower and rationed when it comes to battering riffs. They pull their breathe in one last time before making this six-minute track descend into pure rage and angst, and finally letting it all sink in. Seems like a perfect way to end albums and live performances. 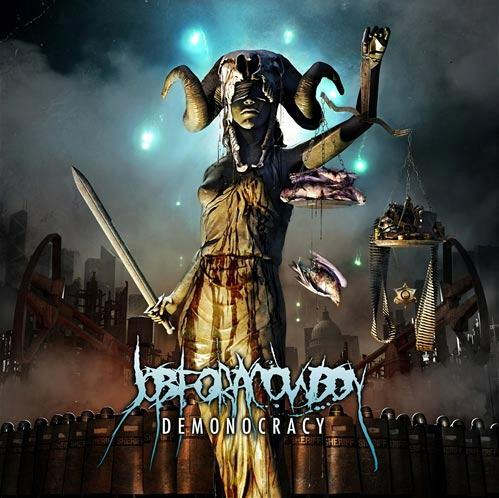 Job For a Cowboy are getting into the groove of things when it comes to making some quality death metal, and it has been ascertained they won’t be stopped by line-up changes . Having put out ‘Demonocracy’ and ‘Gloom’, the current one seems to be peaking. Let’s hope that doesn’t change for some time now.